Bike touring company combines fitness and fun in a new way to explore the region. Sixteen pairs of eyes and ears are listening closely, and most of the 16 people those eyes and ears belong to are also scratching notes on a pad, intent on capturing the key points of Mitchell’s steady flow of information and instructions. Like Mitchell, they are enthusiastic about growing mushrooms, and they are looking to him to teach them how during this three-hour workshop on cultivating the Garden King Mushroom. The Garden King, as its name suggests, is big, and grows well in gardens, explains Mitchell, who channels his mushroom passion into his Denman Island-based business, Key to Rise. During the workshop, he presents a brief overview of mushroom science and growing techniques followed by a hands-on demonstration of how to grow the Garden King. Within 90 minutes, the workshop has produced a 15-square foot mushroom bed made of fresh alder chips layered like a sandwich with Garden King spawn, spread out under a grapevine in farmer Maxine Rogers’ orchard. Rogers will need to spray the bed with water every other day, and in 10 to12 weeks, if all goes well, she’ll have a bountiful crop of tasty mushrooms. A two week dormant period (or seemingly dormant, because much is going on beneath the surface) will follow, and then there will be another flush, and so on every fortnight till the weather gets cold. At that point, Rogers can cover it with more chips, leave it to overwinter, and expect more mushrooms next spring. Mitchell invites everyone to grab a handful of the spawn, smell it, and get a good look at the mycelium—the delicate, almost invisible network of cobweb-like fibres that run through it. Mycelium permeates all soil and, because it ‘eats’ by breaking down organic matter (and even stones) is instrumental in creating soil. When we walk through a forest, we see the trees, but equally significant is the vast system of mycelium that runs below us, which the trees depend on. Mitchell knows how to do that. He shares tips and tricks such as how to “tickle” the mushroom bed with a pitchfork to stimulate mycelial growth, how and when to persuade a reluctant mushroom bed to fruit with just one good watering, and how to use your initial bed as a starter for a second. He answers questions about finding the best site for a mushroom bed, how big the mushrooms should be for harvesting, and how to cook them. “What if we have too many ready at once?” someone asks. Mitchell flashes a big smile from under his well-worn straw hat. Clearly, he likes that idea. “Oh, that definitely might happen,” he says enthusiastically, and goes on to describe the ins and outs of freezing and the pros and cons of drying the Garden Giant. There seem to be few questions he can’t answer, sometimes citing recommendations from experts, but mainly telling stories from his own experience as a grower and picker (and eater) of mushrooms for some 20-odd years. Mitchell’s interest in mushrooms has undergone a number of incarnations over these two decades. 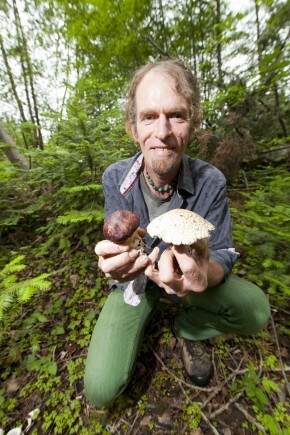 He’s picked Pine, Chanterelle, Morel and other wild mushrooms in the mountains and forests of Vancouver Island; grown Shiitake, Oyster, Reishi, Matsutake, Shaggy Mane and more than a dozen more types of cultivated mushrooms; he’s founded an innovative mushroom-growing co-op, operated a high-tech growing lab, dabbled in “nutraceuticals” (medicinal mushrooms), and sworn off mushrooms almost entirely until forming Key to Rise last summer. Through Key to Rise, Mitchell offers workshops on growing different types of mushrooms—one workshop on the “raw wood chip” varieties such as the Garden King, and another on log-drilling, which is the technique for Shiitake, Oyster, and Reishi mushrooms—and on picking mushrooms in the wild. He also sells ready-made mushroom grow-kits that people can take home to harvest a good-sized crop of Oyster mushrooms in just a few weeks, but his main focus is education. “In this age when we’re realizing we need to develop more sustainable and self-sufficient ways of feeding ourselves, people need to know about mushrooms,” he says. Mushrooms tend to be a bit of mystery, he says. “They aren’t a fruit, they aren’t a vegetable. They appear sporadically, or not at all, and then all at once. They look different than anything else. That is part of what got me interested in mushrooms in the first place. But once I learned more, I realized they are like other plants—once you understand their growth parameters you can cultivate them. “I love teaching because I watch people soak in the information and I can see them go ‘ah-ha’ as they come to understand how mushrooms grow,” he says. “It’s great to see how quickly they pick up the knowledge they need, and to know they are on their way to cultivating, picking and eating the freshest mushroom they’ve ever had. And I love the way mushrooms work with a permaculture approach that utilizes natural seasonal settings and readily available natural materials,” he adds. In particular, he says, the Red Alder, a common Vancouver Island tree that some people consider akin to a weed, is a cornucopia of mushroom potential. Mitchell has always found mushrooms fascinating, but it was about 20 years ago that he first let mushrooms change his life. In 1997 he moved to Denman Island, homesteading a piece of land and starting a family, all the while with mushrooms on the brain. At that time one-third of the island was slated to be logged, much to the dismay of almost all Islanders. Mitchell joined a group that was looking for a way to buy some of the still-intact Douglas fir forest. They put together a business plan that included sustainable forestry, limited development and non-timber forest products—including mushrooms. The initiative was ambitious and demanding, and didn’t succeed, but it got people talking about mushrooms on Denman Island. In the meantime, Mitchell was cultivating Shiitakes on Alder logs on his property with his partner, selling to friends and at farmers’ markets. Perhaps because he’d stirred up local interest in mushrooms, he soon found himself a partner with three others in a new venture called the Cultivated Forest Mushroom Cooperative. This initiative went the high-tech route, with state-of-the-art growing facilities that looked a lot more like a science lab than a forest floor, and a sophisticated business plan that included both edible mushrooms and nutraceuticals—mycelium with high medicinal value such as Cordyceps. It was an exciting and demanding project. “We were learning to take the mushroom through every phase from the petri dish to grow logs,” says Mitchell. But it was also an innovative and risky venture facing a lot of unknowns. After four years, the co-op team made the difficult decision to close the operation. “It was just too tricky to be a wholesaler of a short-shelf-life product on a Gulf Island,” says Mitchell. For a few years after that he limited his mycofilia (mushroom-loving) to picking wild mushrooms for himself, his friends, and family. But it didn’t take long for him to reconnect with his passion for sharing his love of all things mushroom, resulting in Key to Rise. “When the Earth formed 4.5 billion years ago and coalesced out of stardust, the first organisms on land were fungi. Plants followed 600 million years later,” says Stamens. When asteroids hit the earth, wiping out up to 90 per cent of species, 250 million years ago and again 65 million years ago, it was the fungi which best survived and repopulated the globe. All life has evolved in close relationship with fungi, he says, and depends on it. But there is much more to fungi than that: fungi provide medicine (antibiotics such as penicillin) and have been found to have the capacity to clean up toxins such as oil spills, polluted water, plastics, dioxins and nerve gas agents. That is why Stamets says that fungi can help save the world. Stamets goes further: mycelium, he suggets, is the earth’s natural Internet, a neurological landscape that infuses all soils and connects with all life. “They are aware that you are there. As you leave your footsteps, the mycelia reach up and respond by grabbing newly available broken twigs or sticks. The mycelia are sentient,” he claims. Mitchell draws inspiration from all this, but remains steadfastly down to earth (pun intended) in his approach. “I want to help people grow mushrooms,” he states, simply. It doesn’t seem to matter where you live. Most of us eventually get caught up n the day-to-day rush and routine of getting where we need to be, and stop looking at our communities as a place to explore and enjoy. Kim Barry and Laurel Cronk of Island Joy Rides want to change that by giving Valley residents the opportunity to play tourist in their own backyard. 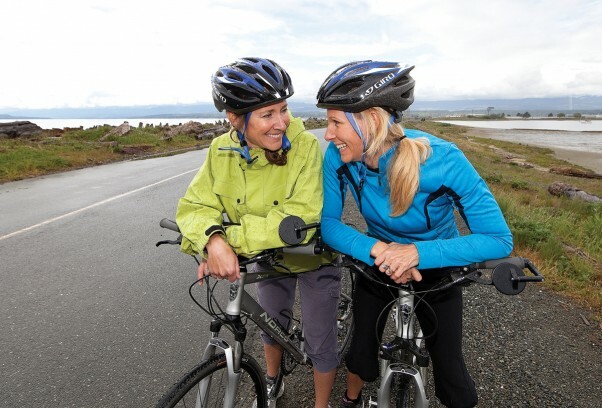 Island Joy Rides is an active travel company that offers single and multi-day bike tours in and around the Comox Valley and Campbell River, all in the belief that the best way to experience any environment is from the seat of a bicycle. “We love where we live and when you try to look at the area through a tourist’s eyes, it’s so much better,” says Cronk. Then Cronk found a career book titled Career Renegade that asked the reader to write down the 10 things that make you come alive. The two of them did it—writing things like biking, hiking, meaningful travel, great food, delicious wine, unique experiences, bringing people together around common interests, appreciating the small things—and the idea of an active travel company jumped off the page. They started doing some market research and talking to people already working in the tourism industry. They quickly learned there actually wasn’t anyone in the Valley doing what they wanted to do. “No one was offering what we were interested in offering,” says Cronk. There were huge gaps in the kind of active travel services available on Vancouver Island and in the Comox Valley, especially in comparison to other parts of the world. Both Cronk and Barry have extensive experience cycling abroad in places like Hawaii and Bali, where that kind of touring is well established and well respected. But it wasn’t enough to convince them to start a cycle tour company. “In terms of the world economy, our timing couldn’t have been worse,” says Barry. “And originally it wasn’t local. [The idea] was take them abroad because we love to travel so much,” adds Cronk. So, instead of planning the launch of their business, they spent the hours on a plane trip to Mexico for a joint family vacation talking themselves out it. Certainly not when you’re guiding people on bicycles out in the elements. You need all the gear to take care of on-the-road bicycle repairs—like flat tires or loose parts—plus the ability to haul any extra gear or luggage tour participants might have or pick-up along the way. You also need an alternative method of transportation if the weather turns bad enough that biking becomes unpleasant or impossible. Finally, you need well thought-out tours that capture the interest and imagination of potential clients. “That’s our biggest thing— the attention to detail and doing it professionally,” says Cronk. So they got themselves a trailer, a support vehicle, and some additional guides to help build a roster of tours. Today John Elson, Chris Round, and Sonja Schum are an important part of the Island Joy Rides team. In addition to their guiding skills, they helped Cronk and Barry seek out interesting locations and businesses in local communities and test routes. It was during the testing that Barry and Cronk learned they didn’t always know where they were going. Once they had their routes down pat, they set to work on a website and advertising opportunities to seek out clients. The first thing to happen was a request from a travel writer for a self-guided, multi-day tour. That meant Cronk and Barry would plan the trip and provide vehicle support, but they wouldn’t do the actual riding with the client. “We referred to ourselves as concierge people,” says Barry with a laugh. Then came a couple in their 80s and an inexperienced rider from the Los Angeles area, all on multi-day trips. Over the course of the tours, Barry and Cronk watched their clients build confidence riding a bicycle, challenge themselves over distance and up hills, and find camaraderie with strangers—all the while discovering the unique places that most visitors (and many locals) never find on their own. A perfect day for a ride. For some it was even life changing—one woman wrote Barry and Cronk to tell them her wonderful experience cycling with the company had encouraged her to keep biking at home, even though she hadn’t been on a bike for more than 10 years. In the Comox Valley, that means sharing the history, culture, wineries, farms, and local food scene that make the Valley what it is. The Island Joy Rides day tour of the Comox Valley starts along the Courtenay River, and takes participants along the estuary into the town of Comox. En route, clients have the opportunity to learn about the ancient fish weirs that show evidence of the remarkable and extensive pre-historic First Nations fishery. Then there is the Beaufort Mountain Range, and the legend of Forbidden Plateau. And did you know that Comox Harbour was one of Captain Vancouver’s exploratory stops in 1792? A stop at Filberg Lodge introduces riders to the amazing grounds, and the town’s remarkable coastline. Eventually, cyclists make their way to Goose Spit to see one of the rarest eco-systems in the world, and learn what happens when the military decides they’ve found a good spot for training exercises. Next up is the area’s fertile farmland and a stop at the Blue Moon Winery for lunch, a tasting and a tour of the property. Cyclists end the tour in Downtown Courtenay with a visit to Hot Chocolates and an opportunity to see their underground production facility. The entire tour is a chance to meet the people of the Comox Valley and go behind the scenes to learn about their interests and passions. The route itself is relatively gentle, with only the Comox Hill posing any real challenge. Serious cycling experience is not required. In fact, Cronk and Barry are adamant all of their tours only need a willingness to try something new and an enjoyment of the outdoors. The idea is to share the sense of joy both Cronk and Barry experience cycling, and the potential of a greener lifestyle. For that reason, Island Joy Rides has partnered with the local Visitor Centre to offer the Valley Wine and Chocolate tour every Friday from 10:00 am to 3:00 pm throughout the summer. It’s an opportunity for locals and visitors alike to see the Comox Valley. The tours will start from Simms Millennium Park. No bike? No problem. Island Joy Rides also offers bike rentals and can provide you with everything you’ll need to safely experience your own adventure, including Norco XFR-2 hybrid bikes, helmets, maps, and tool kits. For locals who want to tour at a time more convenient for them, they can go ahead a book a private tour. Here Cronk and Barry can really cater to the special needs of the group, and things really get fun. Island Joy Rides has guided staff parties, couples anniversaries, birthday parties, friend’s weekend away, and even team building exercises. The basic route and the group’s interest drive the experience—that can mean anything from a birthday cake on the beach to a special self-guided tour just for you and your loved one. Their goal is an engaging and memorable experience for their clients. To learn more about Island Joy Rides and the tours they offer, go to www.islandjoyrides.com. Their group tour season is mid-June to mid-September, with private bookings available year round.